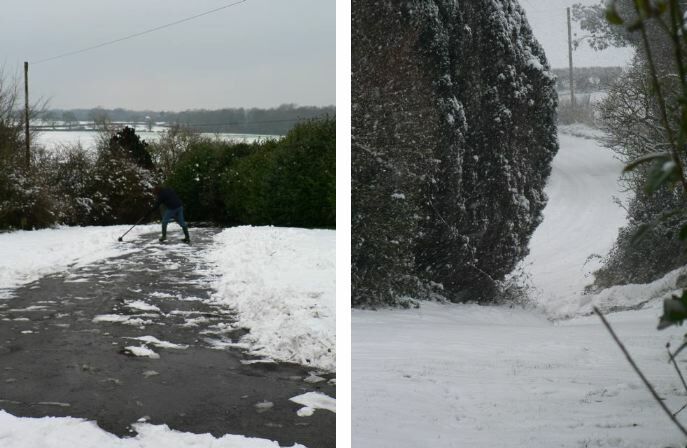 That’s DS clearing the drive! The road goes up the hill one side to a main road, and down then up a very narrow road with a couple of tricky hills that snakes thru a small village. Believe me, we will be staying in for much of the day if not the whole day. I suggest a cup of cocoa (with marshmallows) and warm socks and a stonkin’ fire are the orders for the day. Categories: non-scrapbooking | Tags: SNOW! | Permalink. I remember that SI issue. It must be a nightmare trying to get anywhere. Do you have a 4×4? We live in a town and the snow has been pretty much just a dusting of about 2cm but the packed ice it has now turned into is really dangerous. Stay safe and enjoy your hot chocolate.